In a nondescript building on Monkland Ave. sometime in July, David decided he’d had enough. The 18-year-old student’s strange journey began in his home in China when he decided to come to Montreal to study finance at Concordia. A few weeks, a long flight and thousands of dollars later, he ended up in a crowded $900 a month homestay that he shared with 12 other people, where breakfast, lunch and dinner were two slices of bread—sometimes with margarine or a hot dog. David’s English wasn’t good enough to enroll directly at Concordia. Instead, he went to New Oriental, one of many agencies in China that helps students apply to foreign universities. He paid the company about $15,000. That agency—which is facing a class-action shareholders’ lawsuit and an investigation from the U.S. Securities and Exchange Commission related to its accounting practices—put him in touch with Peter Low, Concordia’s recruitment agent for Chinese students. Concordia’s admissions website explains that, “for an additional fee,” the university can guarantee Chinese high school students a “fast-tracked and simplified application process,” as well as provide homestays and airport pickup and help them to register for ESL classes. Most importantly, Low said, students who apply through this program do not have to prove they can speak enough English to understand their classes. A student like David, whose first language is not English and who has never studied in English, would ordinarily have to pass a standardized language test like the Test of English as a Foreign Language to apply to Concordia. Instead, students in this program take an English proficiency test when they arrive at Concordia. Depending on their ability, they are required to take up to eight intensive English classes at Concordia’s Centre for Continuing Education. These five-week-long, non-credit classes cost $3,750 each. When David first enrolled, the classes cost $3,300, but the university increased the price by $450 after adding half an hour to each class. Tuition for the full eight-course program is $30,000. Students who complete all their required classes with a grade of 75 per cent or better can then enroll in their program of choice. Although his services cost $2,200, Low noted in the same email that the university’s usual $90 application fee is waived for students who apply through him. David sent a total of $15,000 to Concordia by bank transfer. Low’s $2,200 fee was withdrawn from that amount, either by the university or by Low himself. Peter Low is listed as the director of the Concordia China Student Recruitment Partner Program on the university’s website for that program. “Low is an actual authorized recruitment agent of Concordia University. The nature of his contract, we’re not quite sure of,” explained Walter Tom, coordinator of the Concordia Student Union’s Legal Clinic. An administrator in Concordia’s recruitment department confirmed that Low is a contracted employee of Concordia. He also confirmed that immigration consulting is part of Low’s contract. “Part of the service they provide is the application process for both the Canadian immigration work as well as the [Quebec Acceptance Certificate],” which all international students must have to study in Quebec. This work is done through Orchard Consultants Ltd., a company run by Low and registered to a residential address in Burnaby, BC. Calls made on Monday to numbers associated with the company were not answered. Concordia spokeswoman Chris Mota explained that Peter Low “coordinates the work with the licensed agents in China.” Those agents help students with their applications for study permits and provincial and federal immigration permits. “We aren’t in a position to know the specifics of licensing requirements in China,” she said, adding that the university did understand that in order to be licensed to work in China, a person must live in and be a citizen of that country. While he was back in China, David said the agency told him he would have to live in a homestay for at least two months. Before he arrived, Orchard sent him a document describing the pleasant homestay he would be living in. But when he was dropped off at the homestay on Monkland Ave., it became apparent that none of the information was accurate. “It was not true. The information about the homestay was different from where I lived,” said David. The document, which David provided to The Link, said that he would live with another Chinese Concordia student. In fact, there were two other students, a Brazilian and a Mexican. Both were studying at private language schools, and only stayed for a month. Teresa did not appear to exist at all. Instead, a housekeeper and four other women (who David believed to be the woman’s mother and grandmother, and her husband’s mother and grandmother) lived on the main floor. The address was also incorrect, although the address listed on the document is for another building operated or owned by Premier Homestay. The document includes a long list of foods that might be served, including, among others, cereal, croissants and muffins, as well as pasta, meat and chicken. Premier Homestay’s website notes that students will be given “nutritious meals,” and also includes a similar list of food. “In the beginning,” David said, “I could eat what I want. In the second month, other roommates come here, about eight people, in the same house. During this time, we eat many bread. The landlady told me everybody just eats two pieces of bread for breakfast. With some margarine. Yeah, I felt hungry, but she told me: too much money for bread,” he said. After paying $900 per month for accommodations that he had been told would include food, David was left with little extra money. Eventually, 13 people were living in the three-story house. Two students shared a room in the basement. The cook and the four other women lived on the ground floor and David shared the top floor—and a single bathroom—with five other people. He left after two months, and is now living in his own apartment. Weilin, who is now in his last semester at Concordia, told The Link that he left his homestay after one month, for similar reasons. He applied through another agency in China and came to Montreal in January 2009. “They did everything. They told us, ‘Don’t worry, we’ll run everything.’ And when we arrived, there was a guy to pick us up at the airport and drive us directly to the place, in the middle of nowhere,” Weilin explained. His homestay was also arranged through Low’s company. The first problem, he said, was the location—the homestay was about a two-hour trip by public transit from Concordia. The agency told him he would be living with a “middle-class, Canadian family,” he said. But he ended up living with an older married couple. “It is a family, but not a family we were expecting,” Weilin said. The couple Weilin lived with didn’t seem to speak much English, he said. For about $1,000 a month, the homestay was supposed to provide him with a room and food—two or three meals a day, he was told. But that also didn’t happen. After one month, he moved into his own apartment. Leanne Ashworth, coordinator of the CSU’s Housing and Job Bank, said that last year, three very skinny female Chinese students came into her office complaining about poor conditions in their homestay. But shortly thereafter, after speaking with their parents, the women told HoJo they didn’t want to pursue the issue any further. “They said they didn’t want any trouble with their schooling and they didn’t want any trouble with Concordia,” Ashworth said. For both David and Weilin, the agencies and homestay companies required all payments other than tuition to be paid in cash. “When I was in China, the company told me just cash. Only cash,” said David. None of the students The Link spoke to were given receipts for any of these transactions. 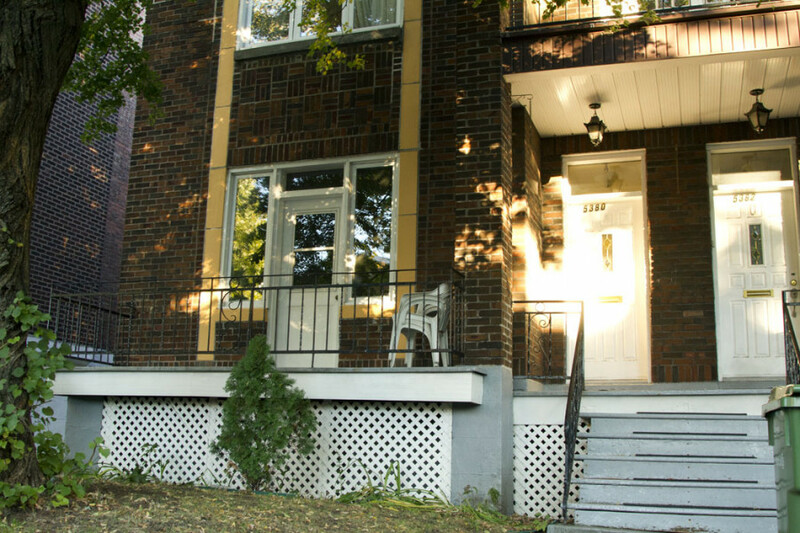 When David arrived in Montreal, he had to pay two months’ rent up front. He gave $1,800 in cash to Renée, an employee of Premier Homestay who picked him up at the airport. Each month’s $900 rent included a $150 commission for Renée, but this commission was only charged for the first two months. He also never signed a lease. Quebec’s Civil Code forbids landlords from asking for more than one month’s rent in advance, and does not allow landlords to require payment of any deposit other than the first month’s rent. When the students move out of the home, the document also says they may not allow the driver picking them up to enter the home. These types of problems are a risk of homestay programs, said Tom. “There’s a reason why [Concordia’s International Student Office] usually doesn’t deal with homestays, because of the danger of abuse.” Compounding that problem, he said, is the “apparent lack of oversight” of the homestay program. He compared the homestays to university residences, which have to be carefully controlled by the university. The administrator in recruitment said that the homestay program was not related to the Concordia China Student Recruitment Program. “It’s completely separate from the program itself. It’s not a function of the relationship between the university and Peter Low,” he explained. “Our agreement with the China student recruitment agency is solely for recruitment of students,” Mota told The Link in an email. As far as the administrator in recruitment was aware, the university does not check on the homestays to ensure that they are providing acceptable care to students. “This is really an arrangement between the students and a third party. We also don’t check on any other rentals, like if you rent a house in Westmount, for example,” he added. Regardless, Tom said, the homestay program is closely associated with the Concordia brand. The university’s website says homestays are included in the fee paid by students enrolled in the China Student Recruitment Program, and Concordia’s name is used in that program’s own website. Furthermore, Low has an email address on the @concordia.ca domain, and signs his emails, including those discussing homestay arrangements, as the “Director, China Student Program, Concordia University.” Low has also been to recruiting events in China with at least one of Concordia’s Vice Presidents. David emailed Low to ask if he could have the deposit back. “When I decide to go to the other language school, I ask him: ‘Can I get my money back?’ but he told me you couldn’t.” Low said the money could only be used if David does eventually come back to Concordia. He still hasn’t told his parents. “I think if I told them, they will worry about me. So when I talk with them, I will say, ‘It’s good.’” He told his parents that he moved out of the homestay so that he could cook his own Chinese food. The administrator in recruiting did confirm that the department is aware of problems at one homestay. “We are pursuing with Peter to make sure that the homestays comply with the Quebec residency standards,” he explained. Other sources familiar with the issue told The Link that, since the questionable quality of the homestays was brought to the attention of recruiting, the department has been working on solving the problem. A solution needs to come soon, Tom said. “The university itself has to do something, because its reputation is at stake,” he said. “The professional body [for immigration consultants] has almost begged us to make a complaint against [Peter Low], but in order for us to do it, we need to have someone come forward and be courageous enough,” said Concordia Student Union Legal Clinic Coordinator Walter Tom. He encouraged any students who have had problems with their homestays or with the China Student Recruitment Program to contact the clinic. They shouldn’t worry about their visa or immigration status or problems with the university, he added. Students who have questions can contact the legal clinic at 514-848-7474, ext. 7375. They can also contact the CSU’s Housing and Job Bank, who regularly deal with landlord and housing problems. HoJo can be reached at 514-848-7474, ext. 7935.